Designs by Lisa Somerville: Cards, Boxes and Bags - Oh My! Cards, Boxes and Bags - Oh My! 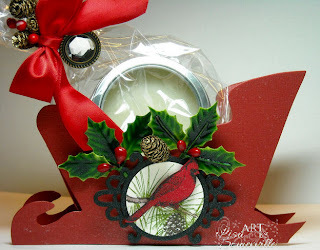 Welcome to the Creative Cuts and More Holiday Blog Hop, featuring Cards, Boxes, Bags and MORE! If you arrived from Dawn's Blog, you are in the right spot, if not you'll want to start at the beginning, so you don't miss out on any wonderful projects. Be sure to stop at each participant's project, and leave them a comment, to be eligible to win this fabulous prize! My first project uses the Sleigh - 3D cut from Maraschino Red - Bazzill Canvas. I used Killer White Tear-able Tacky Tape to assemble my project. The images are from the following Heartfelt Creations Sets - Cardinal Family and the Holly Berry Filler set. The Pine Branch and Pine Cone images were colored with markers and stamped on Vanilla Card stock, then cut with Spellbinders Circle Dies and layered on a Black Circle. The Cardinal was stamped in Black on Red card stock, then cut using Heartfelt Creations Cardinal Family Die. The die cut under the circle is from Heartfelt Creations Decorative Butterfly Border Die, which I altered slightly to fit under my circle panels. I added some Holly and Pine cone embellishments, popped in a candle gift, and tied on a pretty Red Satin Bow/Button Embellishment. The Button/Bow fits this weeks Tuesday Throwdown Challenge. 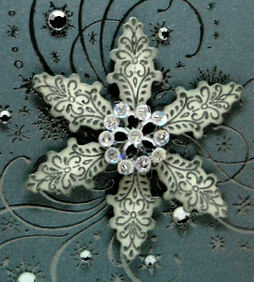 Before assembling my bag, I Silver Embossed the swirl from Heartfelt Creations Snowflake Medley Swirl Set. 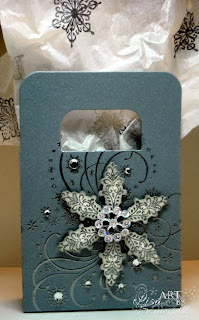 The beautiful snowflake was created using Heartfelt Creations Snowflake Medallions - embossed in Silver on White card stock and cut with the Holly-Ornament Die . The edges are sponged in Grey, then popped up over the swirl image. To finish the project, I added some Silver Gems and a Flower Center to the Snowflake, along with some Snowflake stamped tissue paper. Thanks for stopping by, I hope you enjoyed my projects! Your next stop on the hop is our Guest Designer Dawn's Blog. Very pretty projects. Love them! Great projects. I love that sleigh!! You make all your projects look so wonderful and easy Lisa. It is nice to see some images not being colored with the wonderful Copics. Thanks for sharing all that you do. Oh Lisa ~ My jaw just dropped to the floor when I saw these perfect projects...they should be put on a pedestal and left by your front door so everyone can see!! Thank you for sharing!! I LOVE LOVE LOVE the sleigh! It's so pretty! I love the box too! I think I need to buy some little decorations to put near my projects - they really enhance the BEAUTIFUL work you have done. GORGEOUS projects - and beautifully embellished! Have a great day! WOW! these are both beautiful projects! Beautiful! Love both of these projects they are stunning! Lovely sleigh and the cardinal is so pretty! The snowflake is always gorgeous with the flourishes. These projects are just amazing! Love the embellishments to "dress" up these wonderful products. Gorgeous projects!! LOVE the snowflake box!! These are gorgeous projects Lisa!!! I love them both! So elegant! These need to be published!!! Oh my gosh, I need about 100 of each for an upcoming craft fair. These are awesome and I'm off to Creative Cuts and More, thanks for the inspiration. Gorgeous and I love the little big. Beautiful work. Wowza, have you been bvusy making beautiful things! Amazing projects Lisa! oh Lisa! beautiful!! that sleigh is a fave of mine.. fab projects! wonderful projects, Lisa! Love, love the sleigh! ohmygoodness ... BOTH of these holiday gift creations are just beautiful! Great design and color choices! Thanks so much for sharing with us! Wow, Lisa! These are such festive and stunning projects! Both creations are amazing! Love them!! Gorgeous projects. Thanks for sharin. Both of the projects are fabulous!! Thanks for sharing them with us at TT this week. LOVE the sleigh! It's so pretty! Love the little bag with the snowflake, it just pops against that color. I just noticed a new "Crafts N Things" DT button on your page, CONGRATS!!! that snowflake bag is to die for! Great blog and great hop. Thanks for your talents and your time. You have great projects. Such festive & delightful projects! Great job as always! Gorgeous, as usual! That silver embossed swirl on the box is amazing!! That snowflake is just stunning! The sleigh is very pretty too! Great projects! 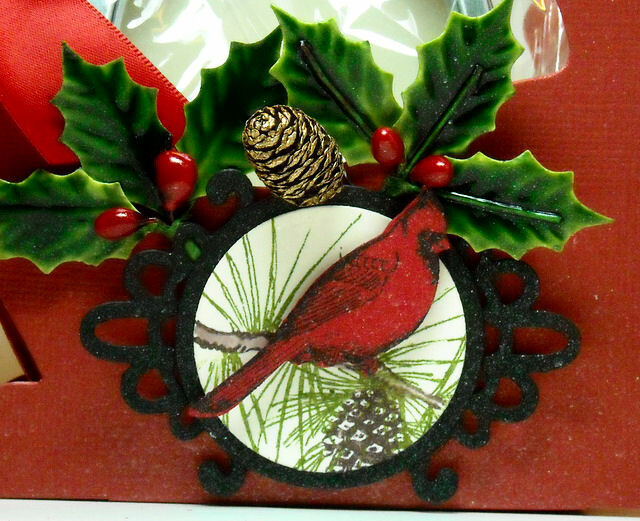 I really like the cardinal on the sleigh and the beautiful swirls and snowflake on the gift bag. Gorgeous projects! Awesome details! I love the silver embossed swirl too!